Myth: Handling a baby bird or bird egg will cause the parent birds to reject it. You’ll often hear this myth stated that if you touch a baby bird, the parents will completely abandon it and it will die. In fact, most birds have a very poor sense of smell, so in most cases are unable to even notice human scent on baby birds (even a skunk’s spray doesn’t seem to bother many types of birds). Not only that, but most types of birds aren’t so quick to abandon their young when they sense danger. Some types will even do their best to defend their young when they are directly threatened, if they can. In fact, the very few known cases where parent birds sometimes temporarily abandoned their nests from something handling their young, comes from handling the eggs and the parents noticing by sight, not smell. When this happens, the parent birds usually won’t care, other than to be a little more cautious than normal. Occasionally, they may temporarily abandon the nest in order to better observe whether whatever disturbed their nest comes back. But this is all as a result of seeing something, not smelling. Indeed, in most cases, even if the nest is destroyed by wind or something to that effect, you could create a new one and put all the nestlings back in it and the parents wouldn’t care that when they left their baby birds were in a different nest than when they came back; so long as you put the new nest near where the old one was so they can find it. This myth was probably started by parents who didn’t want their kids handling baby birds (whether out of the nest or not) because of the potential for the kids to hurt the birds and for the potential of the bird’s parents to attack the kids, in some cases. There is also the annoying habit of the kids then bringing the eggs or baby bird home with them, which tends to ultimately doom the bird in question. Baby birds quite often will leave the nest and walk around before they are fully able to fly (this is very normal), so it is unlikely if you see one on the ground that its location is unknown by the parent birds. In these cases, many types of birds find and identify their young by sound more than anything. If the bird is a nestling (will appear sparsely feathered and not capable of hopping around), probably best to locate the nest, which should be very close, and put it back. 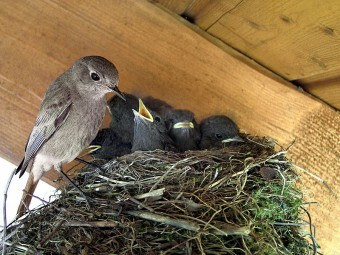 Nestlings should be in the nest, not on the ground. If it’s a fledgling (can hop around and even possibly flit a little), this probably won’t be the only time it falls from the nest or branch the nest is sitting on. You can put it back or not. It will be slightly safer for them in the nest, but many predators, such as cats, don’t find climbing trees to be any problem to get at the baby birds. Also, the fledgling bird is likely just to hop right back out and back down where you found it, so there is little point. At this stage of their life, they are not far away from being able to fly and are commonly found on the ground. In these cases, the parents are likely well aware of where their young are and look after them the best they can in the interim. So unless you know for a fact that the parent birds are dead, you can choose to either leave the bird there or put it back in the nest. Taking it home to take care of it is a bad idea as there are certain things they need to learn from their parents such as behavior, vocalizations, and survival skills, that you are poorly equipped to teach them. If you know for a fact that the parents are dead, you should contact your wildlife rehabilitator, who will be able to properly care for the birds. Killdeer and Mallards are among types of birds that are ready to leave the nest within a few minutes of hatching, including already being capable of getting food for themselves. Although most birds can’t smell very well, some types of birds do possess the ability to spray potential predators with a very smelly substance, to help protect themselves. Among those birds that have this ability are fulmars who spray a very smelly substance out of a tube in their bill. They can spray this oily substance and hit a target up to around twelve feet away. Ducks and Hoopoe will often poop on their own eggs with particularly smelly discharge to discourage predators from eating them. Particularly in the Hoopoe’s case, you can smell their nests from quiet a distance away, very similar to a skunk’s spray in terms of level of smelliness. Hm. I wonder what happened with the baby birds I played with when I was young, then. I was about five years old and hadn’t yet been told this so-called myth. I found a nest in my swing set with three nestlings in it. I took them out, played with them for a little while, and then put them back. A couple of days later when I went back to play on the swings, the three baby birds had been pushed out of the nest. They’d splattered on the top of the slide and baked to it in the sun. x_x When I went crying to my father, THEN I was told that handling baby birds will cause the parent birds to reject them. Could just be that they hopped out again and happened to land on the hot slide with nobody to rescue them in time. Doesn’t mean they were pushed out of the nest. 1. Once a baby sparrow fell in my house so after 2-3 days of care, we let her go and immediately she was attacked by 10-15 other sparrows. I don’t know what happened afterwords. 2. We had pet pigeons and due to curiosity we handled the chicks but the big pigeons abandoned them for half day and then everything was normal. 3. Once cleaning out the terrace we found out sparrow chicks in one of nests, one was alive and one dead, so we just removed the dead chick and left the nest and other chick where it was before, the big sparrows never cared for our interference. A mother rejected her egg. My dad won’t let me bring her in the house. At what temperature will it freeze to death? Not a myth. I one climbed a tree and found a nest with 3 newborns and no parents around. I briefly touched the largest one on its body to see what it felt like. The next morning it was laying on the ground at the base of the tree dead. The other two were still in the nest (with momma this time). Coincidence? I think not.